I have over 20 years experience in training dogs and currently have 4 German Shepherds of my own who either compete in competitive obedience and rally obedience, or are training for future competition or just enjoying their retirement. They also have fun doing agility and Treibball. I am passionate about my dogs and dog training and enjoy meeting new dogs and of course their owners! In 2011, I competed at Crufts in the Obedience Inter Regional competition with my dog Thunder (Magicmapps Thunder Storm) and we came 1st in our respective class and we had a fabulous day! ​In 2015, I competed with my dog Rumble (Joevaness Fire Storm) and we came 2nd in our respective class in the Inter Regionals, again having a fabulous day. ​I also competed again at Crufts in the 2017 in the Rally Inter Regional competition with Thunder and we came 3rd, having an amazing day! 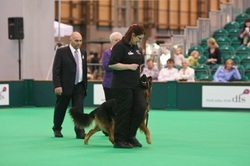 I currently judge obedience competitions and also the Kennel Club Good Citizen Dog Scheme assessments.